Dyslipidemia is common among patients with amyotrophic lateral sclerosis (ALS).1 Higher-than-expected levels of low-density lipoprotein cholesterol (LDL-C), total cholesterol (TC), triglycerides (TG) and low/high-density lipoprotein ratio (LDL-C/HDL-C) have been reported among patients with ALS by some but not all studies.2-7 In a recent observational study we found that patients with ALS had increased levels of apolipoprotein B and LDL-C up to 20 years before diagnosis.8 Because muscle atrophy is a contributing factor to metabolic dysregulation and little is known on the earliest onset of muscle atrophy in ALS, it is unclear whether dyslipidemia plays a causal role in ALS or represents purely an early non-motor sign of ALS. PRS of LDL-C and TC were both significantly associated with ALS risk (Table). The associations were similar when using either European-ancestry or trans-ethnic GWAS results of lipids, although the best-fitted PTs were lower and the numbers of SNPs included in the best-fitted quantiles were smaller when using European-ancestry GWAS results of lipids. In the analyses using European-ancestry GWAS results of lipids, the best-fitted PTs were 5×10−5 for both LDL-C and TC to predict ALS, with odds ratio (OR) of 1.17 (95% confidence interval [CI] 1.11-1.23, P=8.82×10−8) and 1.15 (95% CI 1.09-1.21, P=8.17×10−7) per standard deviation of the PRS for LDL-C and TC, respectively. SNPs in the best-fitted PT quantiles explained 0.08% (LDL-C) and 0.07% (TC) of the variance of ALS. In contrast, PRS of TG and HDL-C were not associated with ALS. In the reverse PRS analyses, in which ALS was used as the base whereas LDL-C, TC, TG and HDL-C were used as the targets, no clear association was noted for any of the studied lipids. Statistically significant associations were noted in all bi-directional analyses of LDL-C and CAD (P<9×10−37). In the best-fitted PT quantiles of LDL-C, less than 500 SNPs explained about 0.25∼0.60% variance of CAD, and ORs for PRS of LDL-C on CAD were around 1.45∼1.56. The associations for PRS of CAD with LDL-C were weaker but still statistically significant. Using both European-ancestry and trans-ethnic GWAS results of lipids, the associations between PRS of LDL-C and TC with ALS were similar and statistically significant across quantiles with PT < 0.005 (Figure 1A-D). Similar results were noted for the quantiles including only genome-wide significance SNPs (PT≤5×10−8), the variance of ALS explained by these SNPs was very close to the largest variance explained by the best-fitted quantile (Figure 1E-F). Figure 1. Polygenic Risk Score Analyses of LDL-C and TC on ALS. A, LDL-C_EA. B, LDL-C_Trans. C, TC_EA. D, TC_Trans. E, Genome-wide significant SNPs in LDL-C_Trans. F, Genome-wide significant SNPs in TC_Trans. EA=European-ancestry data; Trans=trans-ethnic data; LDL-C=low-density lipoprotein cholesterol; TC=total cholesterol; ALS=amyotrophic lateral sclerosis; PT=P-value threshold of the association between single nucleotide polymorphisms (SNPs) and base; nSNP=number of independent SNPs included in the quantile. Bold black bars stand for statistically significant predictions, whereas gray bars stand for predictions that are not statistically significant. The rectangles mean the best-fitted results. 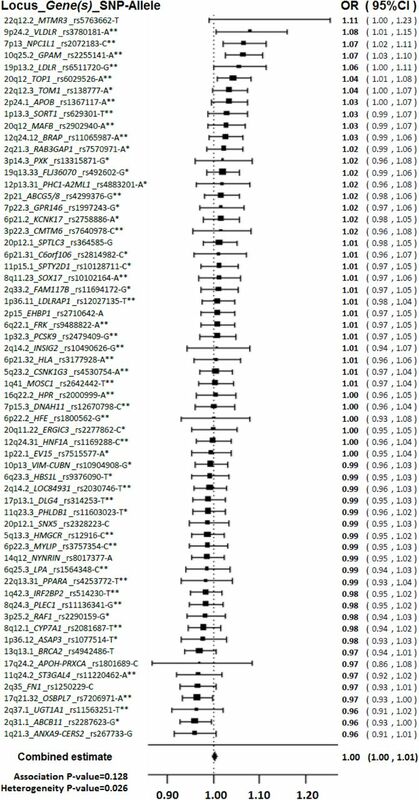 LD score (LDSC) regression was performed to calculate the heritability and genetic correlation between the base and target.15,16 The genetic correlations (rg) between blood lipids and ALS were weak (rg≤0.06) and not statistically significant (P≥0.47) (data not shown). The genetic correlation between trans-ethnic LDL-C and CAD was moderate and statistically significant (rg=0.21, 95%CI 0.13-0.29, P=1.22×10−6). The SNP-based univariate heritability of LDL-C, CAD and ALS estimated from LDSC regression was 0.20 (95%CI 0.11-0.29), 0.10 (95%CI 0.08-0.12) and 0.05 (95%CI 0.03-0.07), respectively. In the Mendelian randomization (MR) analysis, 62 of the 63 SNPs specifically associated with LDL-C or TC were found in the ALS GWAS. The combined effect of these SNPs on ALS was null (OR=1.00, 95%CI 1.00-1.01, P=0.13). Some individual SNPs were however significantly associated with ALS risk (P<0.05, Figure 2). Among the alleles up-regulating LDL-C or TC, five were associated with a higher ALS risk, including alleles in the loci close to very-low-density lipoprotein receptor (VLDLR), Niemann-Pick C1-like protein 1 (NPC1L1), glycerol-3-phosphate acyltransferase 1, Mitochondrial (GPAM), LDL receptor (LDLR) and topoisomerase I (TOP1) genes. Figure 2. Mendelian Randomization Analyses between LDL-C, TC and ALS. Among the genome-wide significant (P<5×10−8) single nucleotide polymorphisms (SNPs)/loci associated with low-density lipoprotein and total cholesterol (LDL-C and TC), 62 independent SNPs that are specifically associated with LDL-C or TC, but not other lipids, were selected as instrumental variables. The individual and combined effects of the LDL-C or TC up-regulating alleles on ALS were plotted. OR=odds ratio per allele; 95%CI=95% confidence interval. SNPs without star are only associated with LDL-C, SNPs with one star (*) are only associated with TC, SNPs with two stars (**) are associated with both LDL-C and TC. Using different polygenic methods on summary GWAS results of blood lipids and ALS, the present study demonstrated a clear polygenic link between LDL-C, TC and ALS. We found that PRS of genome-wide significant SNPs that are known to increase LDL-C and TC levels were associated with a higher risk of ALS. Several genetic variants involved in the regulation of LDL-C and TC were further shown to be associated with the risk of ALS. Unlike several more common complex diseases (e.g., CAD, schizophrenia), low-frequency or rare alleles have been suggested to explain more heritability of ALS.12 Because GWAS focus on common SNPs and usually require minor allele frequency to be larger than 1% in the population, they cannot capture potential effects of rare variants. Family and twin studies on the other hand capture all genetic effects from both common and rare variants. 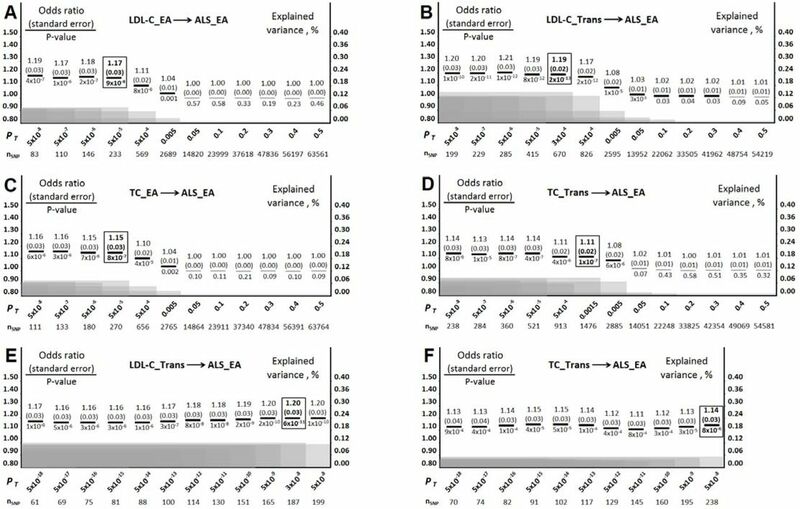 Figures 1A-1D illustrate that the explained variance of ALS diminished as more SNPs were included, and the associations of the corresponding PRS with ALS became weaker and not statistically significant. Therefore, deep sequencing for rare variants in future ALS studies might be essential, to understand the genetic mechanisms of metabolic dysregulation and ALS. In parallel, molecular studies are also needed to shed light on pathogenic mechanisms of the suggested cellular pathways related to lipid processing and ALS risk. In order to check the directionality of the association between PRS for lipids and ALS, we performed bi-directional PRS analyses using PRSice v1.25,20 in which ALS caseness was used first as target (outcome) and then as base (exposure). In the base data, we clumped linkage disequilibrium (LD) linked SNPs by using HapMap_ceu_all genotype as the reference (release 22, 60 individuals, 3.96 million SNPs), and used the parameter settings recommended in PRSice; a clumping threshold of p1=p2=0.5, a LD threshold of r2=0.05 and a distance threshold of 300Kb. We grouped independent SNPs into different quantiles with gradually increasing P value thresholds (PT, ranging from 0 to 0.5). We standardized PRS of each quantile before we calculated their effects on the target. The PT of the quantile that explained most variance of the target was defined as the best-fitted PT. We performed LDSC regression by LDSC v1.0.0 to calculate the heritability and genetic correlation between base and target, using information from all available (directly genotyped and imputed) SNPs.15,16 Finally, we conducted a MR analysis taking advantage of information on 63 loci that are known to be specifically associated with LDL-C or TC (the top SNP in each genome-wide significant locus, P<5×10−8), but not other lipids. The 63 SNPs were considered as instrumental variables; their individual and combined effects on ALS were calculated and plotted using “metafor” package in R.3.2.3. We would like to thank the Global Lipids Genetics Consortium, the CARDIoGRAMplusC4D Consortium, and the Project MinE GWAS Consortium for sharing their summary GWAS results. This study was funded by the Swedish Research Council (grant no. 2015-03170), the Karolinska Institutet (Senior Researcher Award and Strategic Research Program in Epidemiology), and the Ulla-Carin Lindquist Foundation. Albert, S.M. Dyslipidemia in ALS: good, bad, or unclear? Neurology 70, 988–9 (2008). Dupuis, L. et al. Dyslipidemia is a protective factor in amyotrophic lateral sclerosis. Neurology 70, 1004–9 (2008). Dorst, J. et al. Patients with elevated triglyceride and cholesterol serum levels have a prolonged survival in amyotrophic lateral sclerosis. J Neurol 258, 613–7 (2011). Ikeda, K., Hirayama, T., Takazawa, T., Kawabe, K. & Iwasaki, Y. Relationships between disease progression and serum levels of lipid, urate, creatinine and ferritin in Japanese patients with amyotrophic lateral sclerosis: a cross-sectional study. Intern Med 51, 1501–8 (2012). Yang, J.W. et al. Hypolipidemia in patients with amyotrophic lateral sclerosis: a possible gender difference? J Clin Neurol 9, 125–9 (2013). Sutedja, N.A. et al. Beneficial vascular risk profile is associated with amyotrophic lateral sclerosis. J Neurol Neurosurg Psychiatry 82, 638–42 (2011). Chio, A. et al. Lower serum lipid levels are related to respiratory impairment in patients with ALS. Neurology 73, 1681–5 (2009). Mariosa, D., et al. Blood biomarkers of carbohydrate, lipid and apolipoprotein metabolisms and risk of amyotrophic lateral sclerosis: a more than 20 year follow-up of the Swedish AMORIS cohort. Annals of Neurology (2017). Teslovich, T.M. et al. Biological, clinical and population relevance of 95 loci for blood lipids. Nature 466, 707–13 (2010). Buscot, M.J. et al. The Combined Effect of Common Genetic Risk Variants on Circulating Lipoproteins Is Evident in Childhood: A Longitudinal Analysis of the Cardiovascular Risk in Young Finns Study. PLoS One 11, e0146081 (2016). van Rheenen, W. et al. Genome-wide association analyses identify new risk variants and the genetic architecture of amyotrophic lateral sclerosis. Nat Genet 48, 1043–8 (2016). Schunkert, H. et al. Large-scale association analysis identifies 13 new susceptibility loci for coronary artery disease. Nat Genet 43, 333–8 (2011). Nikpay, M. et al. A comprehensive 1,000 Genomes-based genome-wide association meta-analysis of coronary artery disease. Nat Genet 47, 1121–30 (2015). Bulik-Sullivan, B.K. et al. LD Score regression distinguishes confounding from polygenicity in genome-wide association studies. Nat Genet 47, 291–5 (2015). Carstea, E.D. et al. Niemann-Pick C1 disease gene: homology to mediators of cholesterol homeostasis. Science 277, 228–31 (1997). McLaughlin, R.L. et al. Genetic correlation between amyotrophic lateral sclerosis and schizophrenia. Nat Commun 8, 14774 (2017). Al-Chalabi, A., van den Berg, L.H. & Veldink, J. Gene discovery in amyotrophic lateral sclerosis: implications for clinical management. Nat Rev Neurol 13, 96–104 (2017). Euesden, J., Lewis, C.M. & O'Reilly, P.F. PRSice: Polygenic Risk Score software. Bioinformatics 31, 1466–8 (2015).